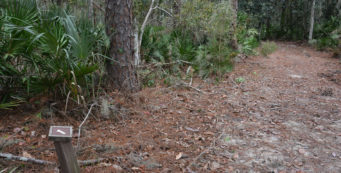 Paddling the Bartram Trail | Florida Hikes! Gliding in a kayak across the St. Johns on a gray morning, it was hard to imagine that, more than 250 years ago, two strangers to this strange land called Florida were doing the same thing in this same spot. I was here with Sandy to participate in the first Bartram Adventure Tour. 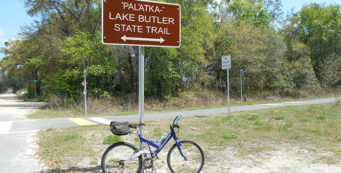 We stayed with long-time Bike Florida organizer Linda Crider at her B&B, the Bartram Inn, in Palatka’s South Historic District, and spent each day with Bartram experts learning about the Bartrams on guided tours. At the age of 66, John Bartram had a large garden on his homestead in Philadelphia. He was a botanist shipping plants from America back to his native England. When England took over Florida from Spain, John heard from King George. He was to become the Royal Botanist, and to go explore this new, strange land. John and his 26-year-old son William headed south by horseback. 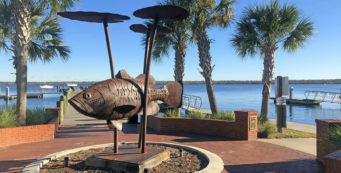 They began paddling the St. Johns River in a dugout canoe in December of 1765, and spent eight weeks following it upriver as far as Brevard County is today. Don’t forget that the St Johns River flows north. That was quite a paddling trip against the current, especially in their era. Other than a handful of settlements where they encountered native peoples, and a couple of trading posts where Europeans had set up shop, Florida was a very wild place: bugs, bears, panthers, snakes, and of course, plenty of alligators. 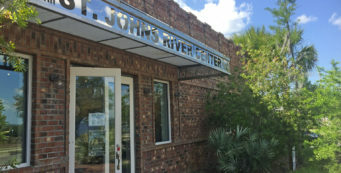 On our last visit to Palatka, we discovered the St. Johns River Center and learned about the Bartram National Recreation Trail. This tour became our first opportunity to find out where it led. Today, it was time to take to the water. We put in at the boat ramp by Shell Harbor. The St. Johns River is wide, so we hugged the shoreline. As the Bartrams were looking for plants, they wouldn’t have ventured far from the shoreline. They would have made frequent trips ashore as the searched for new and unknown plants. I’ve walked among the redwood and sequoia trees out west, and felt insignificant standing below them. I can’t imagine what it would have been like to stand in a forest of ancient cypress trees. Thousands of years old, with water and cypress knees between them, they were part of a world that will never be seen again. It will take generations before a such a grand forest will ever establish itself here again. Hopefully, across so many generations, will come the wisdom to preserve these places of the past. Stopping along the way, Dean would point out places that William and John may have written about. William wrote a travel journal, which was published. After John returned and did another canoe trip on his own just before the War of Independence, he wrote a book that you can still find sold today, popularly known as Bartram’s Travels. You can read William’s journals here. By special arrangement, we were allowed to pull up on a piece of private property and walk back to a very haunting place, Satsuma Springs. Crossing the yard, we walked below the arches of ancient oak trees on a groomed path to the spring. Here we were standing in the same place where William had stood and written about. Here his words reminded me of a sermon, preaching about the beauty and importance of natural places. We’re lucky that this hidden piece of history has landed in the hand of a caring and understanding person. She realizes it’s a unique and important place, and has set the wheels in motion for it to be protected for future generations. Maybe one day anyone paddling by will be able to visit Satsuma Spring. As we paddled past Acosta Creek Marina, I spotted a beautiful blue ketch rigged sailboat. Being an old sailor, I was drawn to have a closer look. Some of my fellow paddlers joined me, but couldn’t feel the connection that I did. She was a well-cared-for vessel and the pride of ownership showed. I’m pretty good at identifying older sailboats, but this one had many unique features that left me clueless. Later, as we were on the return paddle, I struck up a conversation with a fellow working on a neglected-looking and filthy powerboat. He said that he was in the process of restoring it for the new owner. I shook my head and said that it looked like he was going to be working it for a very long time. He pointed at a shiny boat at the next dock. I had noticed it as I went by earlier. “That’s the last boat I restored,” he said. I couldn’t imagine it ever looking as rough as the one he was currently working on. I told him that I was impressed – and I didn’t impress easily after working on the Space Shuttle for over thirty years. He was amazed by first career, and I was amazed by the skills he possessed as a shipwright. He couldn’t imagine that I wouldn’t want to continue on the next space program, because he couldn’t imagine ever giving up restoring old boats. Concrete was once a material that people used to build strong ocean-going boats. The fell out of favor many years ago. When I went looking for an inexpensive cruising sailboat more than 20 years ago, I came across many neglected concrete boats. After turning off the river to paddle toward Welaka Spring, our guide pointed to a beautiful river bluff Bartram had written about being close to the spring. Believe it or not, the spring was used for bottled water – glass bottles – in 1907 by the Welaka Mineral Water Company. By the 1920s, a hunting and fishing lodge had been built on the bluff. There are still many “Old Florida” fish camps along this stretch of the St. Johns River today. Reaching the spring we celebrated with a snack. Dean told us the story of how after a large piece of karst had broken off and reduced the flow of the spring, “some local boys” had tried to “open it up” with the help of some dynamite. The blast did just the opposite. It filled much of the spring opening with smaller chunks of broken rocks. Fortunately, the spring is still flowing, and it is accessible by kayak. We were off the river before the storms hit. Always a good plan! Leaving the spring run, we enjoyed paddling with the current back to the boat ramp where we had begun. Sandy was there to meet me after spending her morning exploring trails around Welaka by foot. We joined my my fellow kayakers and our old friends Robert and Laura at Shrimp-R-Us for lunch before heading back to Palatka for one more night on the Bartram Adventure Tour. It didn’t look like much, but the food was great! 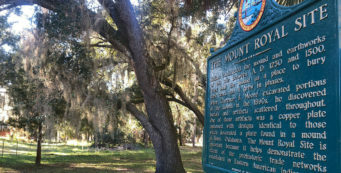 With the Bartram Inn in Palatka as our base camp, we spent four days with local naturalists and Bartram experts learning about John and William Bartram, where they visited in the area, what they saw, and how their visits impacted history. Here’s a video overview of our whole adventure, which included hiking, biking, and this paddling trip as well as evenings spent enjoying Palatka.